I got a late and slow start working on my 50 Layouts goal this year, but got 5 done in the last couple weeks. Although I had a hard time at first, I finally felt like I was on a roll after the third layout. It's been months since I've sat down and created a traditional layout, so I'm admittedly struggling with finding my style. Some of them came easier than others. Some I like more than others. Some of them were done under an hour. Some I struggled with - whether it was the colors or the journaling. Some don't feel like they're "me" and I was tempted to rip them apart and try again. I resisted though and considered it a learning opportunity. Can't love 'em all, right? My process was really just to choose an old Studio Calico scrapbook kit from my stash and match it with stories I want to tell. Since I had a lot of photos already printed for the purpose of making a layout (ahem, last year), I started with those first. It's difficult for me to do a page, start to finish, in one sitting, so these were mostly created by pushing supplies around for 15 minutes here + there before committing to glue it all down. Then I'd tidy up my desk, toss the little bits of trash and start all over again. I also used Ali's Story Kits as a jumping off point for a couple of layouts and can see myself pairing them with my kits to really use them up. My list of potential stories matches the product nicely and I couldn't be happier with this subscription. I'm really looking forward to watching my 50 Layouts gallery progress throughout the year! This is my chance to mix it up a bit with sizes and styles, while putting a serious dent in my stash. Although I'm a little bit off of my "layout per week" pace, I'm happy with where I'm at. Like I said before, I tend to make a few layouts at once before I regroup and move on to something else, like Project Life. 1. Gather / This one is about documenting four generations in my and Mark's family after our kids were born. It was inspired by and features embellishments from Ali's Gatherings Story Kit and the background paper is Gossamer Blue Gramercy Road The Third Ward. I love having these two photos together now. 2. 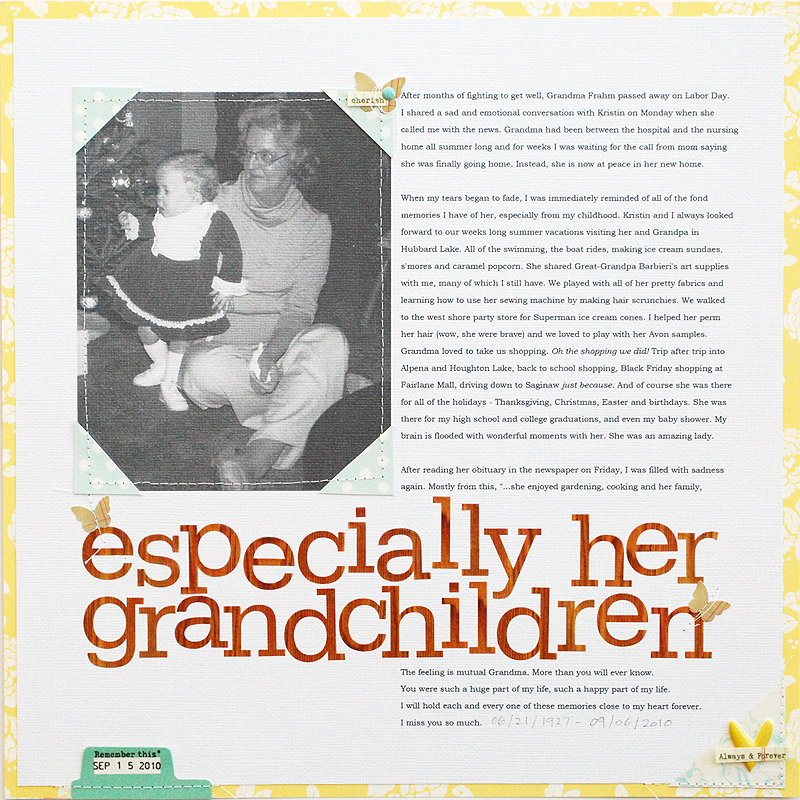 Especially her grandchildren / I've been wanting to make this layout forever. The journaling comes from a 4+ year old blog post I had written about a week after my grandmother passed away. The text and photo were printed directly on cardstock and I love the texture it created on the old photo of her + I. The colors of this spread were inspired by Marcy Penner and Stephanie Bryan's Creative Jumpstart 09. 3. 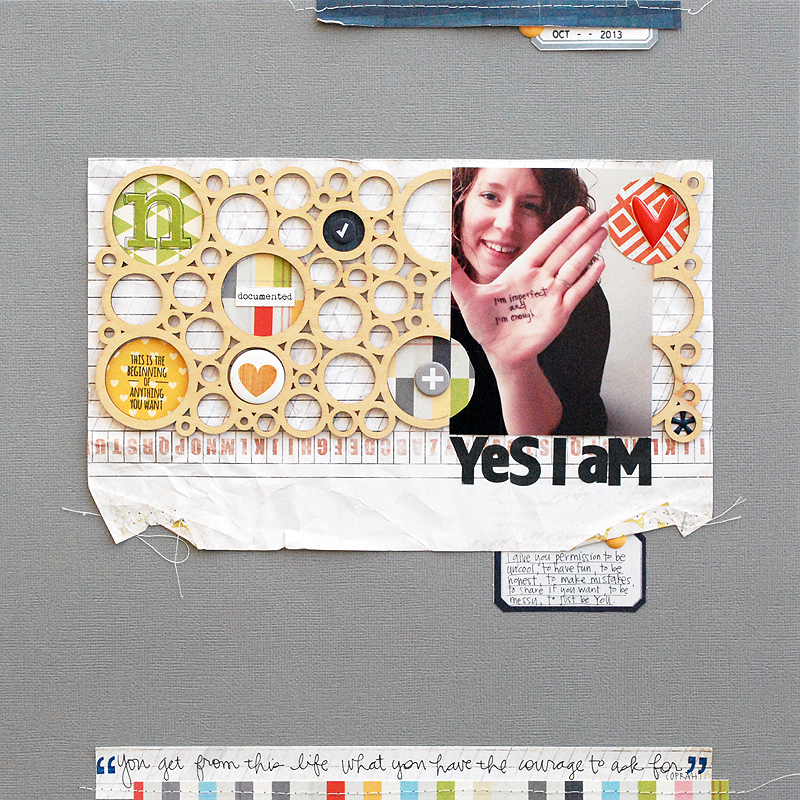 Yes I Am / This layout was based on an assignment from Brene Brown's Gifts of Imperfection Lifeclass with Oprah back in 2013. All of the supplies are from the Studio Calico Copper Mountain kit. 4. "I'll be right back" / Another layout that is focused on a story and Ali's Story Kit. This time "firsts." I had this journaling written out and the photo printed for about a year, and finally have it all in a layout. Potty training Parker was one of our biggest challenges with him, so when it finally clicked a year ago, it was a big deal. The "first time" chipboard diamond near the bottom of the page inspired the diamond pattern throughout the rest of the layout. Other than Ali's kit, everything else is from the Studio Calico Copper Mountain kit. Super happy with how it turned out. 5. You can do it / Another old-ish photo that I already had printed, but I added hand journaling to the white space with current random thoughts + encouraging words for the new year. Yup, I wrote 'say yes' twice because 'no' is usually my gut reaction. It's a good reminder for me. This is another Copper Mountain layout and the white plastic ampersand is from Bananafish Studio. In 2015, I want to use my stash and tell more stories, so I've set a goal to create 50 layouts. 5 down, 45 to go. You can see them all here.